The quest for easy Chinese New Year Crafts continues! I've been reading up a bit on the holiday to help me explain it to my older son. Recently I learned that we often see plum blossom flowers decorating homes around this time of year. Apparently they represent perseverance, courage, and reliability. (Beautiful, right?) Well, we don't have any plum blossom flowers around here.... but we do have pink tissue paper and twigs. So we grabbed our crafting materials and then set to making ourselves some really easy and beautiful flower decorations for the New Year! This post contains affiliate links. Thank you for your support! You can read more about my affiliate link policy here. Prior to doing this craft, we've been reading quite a few Chinese New Year Books. (I find that picture books explain ideas in much better than I ever could.) Here are some of our favorite reads so far! 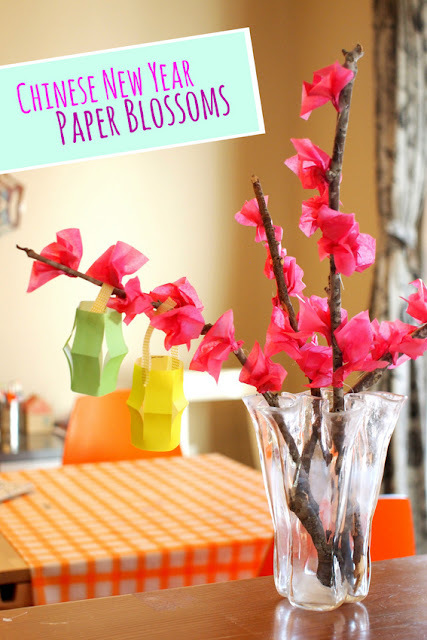 Let's Make Some Tissue Paper Flowers for Chinese New Year! To make the flowers, simply crumple your tissue paper. My preschooler made two and then promptly gave up. I made the rest of them. He was much more interested in the next step. The hot gluing! Yup. I let him use the hot glue gun. To make sure we stayed safe and didn't burn ourselves... I placed the twigs in a vase first and then we glued the flowers onto them. I told him to not touch the silver tip and keep the tip away from me. I gave him the mantra "touch, squeeze, and let go." I told him to touch the tip of the glue gun to the twig. Then, I told him to squeeze the gun and then let go and pull the tip off. That helped him a lot. I love the colors of Origami Paper. First, fold the origami paper in half. Then cut it. Now you have two rectangles to make two lanterns. Fold a rectangle in half. Then, cut slits starting from the middle (folded portion). Your slits should not touch the outer edge. Then, I used washi tape to make the lantern's handles. That's it! I hope you have fun making this beautiful craft with the kiddos. And if you're not too keen on letting your kid use the glue gun (or you have a whole class that you're teaching and don't want to deal with glue guns), try out my cherry blossom tissue paper art (with printable tree!) It's a really easy, easy way to do something quite similar and quite beautiful too!